This is a weird one, and I've been Googling for days without any luck. I have a client who runs Exchange/Outlook 2016. Jane Doe is in the Marketing department, and her AA (John Smith), and a few others in that department (We'll call them Jimmy, Sally, and Bob) cannot see her Free/Busy status (the entire row is grayed out) when in the "Scheduling Assistant" in Outlook. I can't for the life of me figure out what's going on. TL:DR: User in Marketing cannot see Jane Doe's Free/Busy status only in Scheduling assistant on the Outlook client. OWA is perfect. 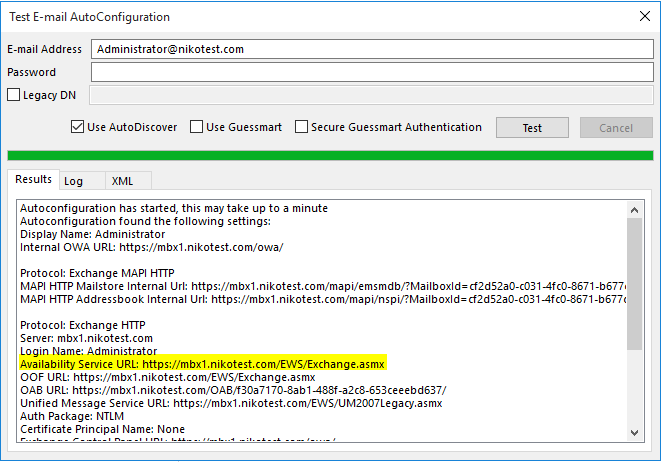 Please check the WebServices Virtual Directory settings, and run the Test E-mail AutoConfiguration on the Outlook client to verify the URLs returned from the server. For out situation, the users that were unable to see Jane's Free/Busy had a shared contact with only Jane's cellphone number in it, that was not a valid contact entry in Exchange. It's just weird because the Scheduling assistant was able to see her Skype status, but her Free/Busy was attempting to pull from that manual contact entry. Resolved by deleting that shared contact and restarting Outlook. I'm assuming this solved it for all users that couldn't see her Free/Busy in scheduling assistant, as the shared contact entry seemed to be syncing. We couldn't validate because of other users' positions in the company. Not the answer you're looking for? Browse other questions tagged exchange-2016 scheduling outlook-2016 or ask your own question. Why do I get “no connection” when viewing another user's calendar?